Young Kids’ kickboxing in Thailand. In Thailand, young kid’s kickboxing is flourishing. 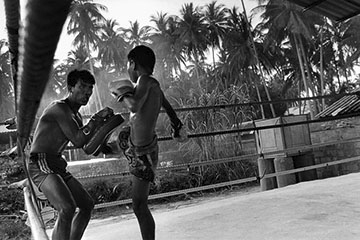 Fights are of extreme violence, similar to the traditional Thai boxing, a martial art called Muay Thai. Young kids, under 10, featherweight are recruited and trained to fulfil their own dreams and the ambitions of the parents: to become a champ. And for a few it can be a springboard out of poverty without going through prostitution or drug, a way to help their family to live with dignity. Kids are sent to live and train in camps, which become their second family, and every month the earnings won through the fights are sent back home. Training is exhausting. Dream is followed by sweat, effort and kicks. Everyday after school, the kids train for hours, with determination, under the guidance of the elders, former boxers themselves. In Bangkok where former champs created a camp inside a slum, or all over the provinces from the southern islands to the east, the elder pass their knowledge to the youngest.